Recently moved into your dream home? Sorting out your home entertainment is probably top of your list, especially if you have children who won't silence until Peppa Pig is on screen. We're here to help – we've got an eye on the best Sky TV deals and packages here at Real Homes, and we know a great price when we see one. Since you've got your broadband deal sorted, it's time to find a Sky TV deal. 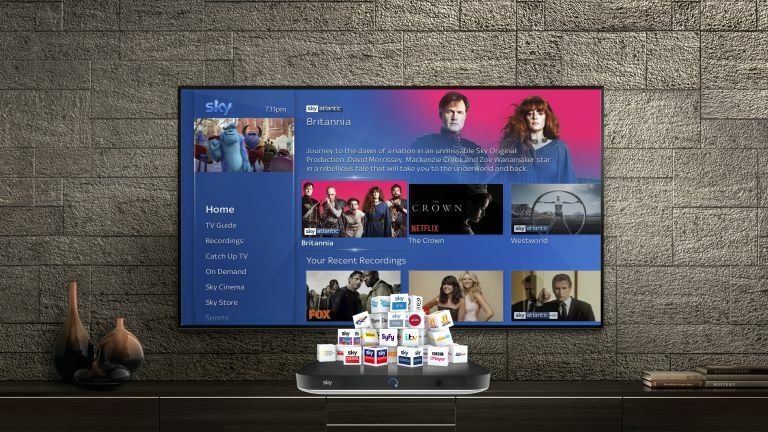 Each week, we take a look at the latest Sky TV packages and Sky Q box offers to ensure you're getting the best deals and offers out there. If you're not sure what you want, fear not. Stay with us as we explain the difference between Sky TV, Sky Q and all of the different add-ons below. It's never been simpler to explore your options with Sky, and for just £22 a month, you'll have use of their default package. You can then pile on any extra add-ons you require such as Sky Kids, Sky Cinema and Sky Box sets to suit your individual needs. Feeling a little lost already? Stay with us, as we've gone into detail about each of the available add-ons below. WHAT ABOUT SKY Q DEALS FOR NEW CUSTOMERS? If you're signing up as a new customer, all Sky TV packages include a Sky Q box by default. When choosing your Sky TV package from the offers below, you'll see two Sky Q deals to choose from. The default Sky Q box is 1TB, and has a one-off £20 set-up cost. There's also a 2TB Sky Q box, but the set-up is £199. However, the monthly cost is the same for both, so it's just the one-off cost to consider. Also, the 2TB Sky Q box can be purchased for £65 instead, but only if you add Sky Q Multiscreen to your bundle at £12 a month. As well as double the storage (up to 1,000 hours in standard definition) of the standard Sky Q box, the 2TB Sky Q deal comes with a few extra benefits, including being able to record six shows at once rather than three, while watching a seventh. You also get the fancier Sky Q Touch remote control, an extra tablet allowance, PLUS you can enjoy selected channels in Ultra HD. Perfect if you've just bought a cheap 4K TV. Firstly, let's get your channels sorted, then you can scroll back up to the Sky Q offers' section once you have a better idea of the overall cost. More of a base package, Sky Entertainment is a mandatory starter pack you need to kick-start your TV watching. For an extra £22 a month taken from your pocket, you'll be able to screen everything from dramas to comedies, documentaries, music and Sky Originals. Top channels included are Sky One, Sky Atlantic, Nat Geo Wild, Comedy Central and MTV. Sky TV deal add-ons are much easier to understand now that they can be purchased individually. You can build your own bundle below, making sure you're not paying for anything you won't watch, and it'll save you money. Scroll for extra details about each add-on to help you decide if you truly need them. One of the most essential add-ons in our eyes, this HD extra means you'll truly appreciate your TV's quality. Sometimes, Standard Definition (SD) just isn't enough as it can appear extremely blurry on modern HD or 4K TVs. Bringing not just brighter colour to the picture, for just an extra fiver, you can also enjoy an extra five times the detail on channels such as Dave HD and GOLD HD. Note: the Sports channels are an further £6 a month. Slightly more expensive than other add-ons, but for good reason, Sky's selection of recent movies gets a new addition every day, and they're all in HD. With over 1,000 films to choose from, if you find yourself choosing a film over a TV programme when browsing what to watch, forget the individual HD add-on and just get this. Although it's more expensive than Netflix and Amazon Prime, we think it's worth it. Parents, rejoice! The small price of £5 a month not only keeps the kids quiet with over 5,000 episodes of TV programmes, but also lets them watch a further 11 channels of kid's live TV. This way, you won't be scrolling for hours trying to find 'that dinosaur programme', and it can be screened on tablets via the app. Let Saturday night Strictly watching re-commence. Ready for all the sports? If you know you'll be glued to the action throughout the year, you can get all seven Sky Sports channels for just £23 a month. Think Sky Sports Premier League, Sky Sports Football, Sky Sports F1, Sky Sports Cricket, Sky Sports Golf, Sky Sports Action, Sky Sports Arena and Sky Sports Main Event (for the world's biggest sporting events). Note: HD is extra. If you'll only be using one Sky Sports channel, you might be better off taking a glance below at the rolling contract options starting from £18 a month. There's no need to sign up for 18 months of Sky Sports if you won't be using it. Behold: the 30-day rolling contract, which means you'll only pay for what you want to watch. Ideal for those who only watch during season-specific times of the year, and it's cheaper in the long run. For those who have several screens in their house and want to watch Sky TV channels from them all, sign up for Sky Q Multiscreen for an extra £12 a month. There's a £20 one-off fee for adding a Sky Q mini box to one other room, and any additional Sky Q mini boxes will have a one-off cost of £99. However, although costly, if you do decide to opt in for multiscreen, it'll lower the cost of the 2TB Sky Q box from £199 to £65, and all of your channels will be in Ultra HD. If a broadband bundle to complement your Sky TV deal is on your mind, then you have the option to add one to your Sky package for as little as £27 a month. This one has unlimited broadband with an average sped of 63Mb which is more than plenty for most tasks, including HD streaming. It also includes Sky Pay as you Talk, as well as Sky Talk Shield for free. Note: be sure to check what's available in your area via the postcode checker on the site. Total for 18 months: £565.95. Want more of the best broadband deals? We've got you covered. With all packages you get at least the standard free to air HD channels. You also get a fair few of these with standard Freeview HD. Clicking on any of the green 'view deal' buttons above will take you to the Sky website, where you can add deals and packages to your cart as you wish. Alternatively, if you'd prefer to have a person walk you through each step of the way, then phone 0800 014 2334 to sign up for a Sky TV package. Be sure to have a good read through the sections above to learn about each add-on first, just so you can go in with a good idea of what's available and you don't feel pressured when you make the call.